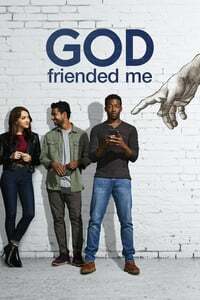 Outspoken atheist podcaster Miles Finer finds his life turned upside down when he receives a friend request from "God" on social media and unwittingly becomes an agent of change in the lives and destinies of others around him. Variety Review - If “God Friended Me” can convince viewers to get past its premise and develop the wholehearted drama fueling it, the series just might find its way. All the 'millennial' trappings in the show were eye-rollingly dumb (where does Cara work that she can have six weeks of writer's block and remain employed? what kind of fancy radio station-looking place is Miles recording his podcast at? ), in that Hallmark Channel way. Not to mention the way that tv-show atheists are always just people that stopped believing in God temporarily because Reasons and inevitably return to the fold by the end. I watched most of this pilot and spent most of the time fantasizing about the potential fascinating scifi premise it 100% will not end up going with: the God that friends Miles is no traditional deity or God that any Abrahamic religion would recognize. Instead, it's the god in the machine. An artificial intelligence that organically arises out of all those social media algorithms and the internet, an entity that can approximate a kind of omnipotence and omnipresence via all the devices and cameras that make up our lives, and that decides to find itself a prophet. So, sort of like a mix of Person of Interest, Early Edition, and Joan of Arcadia. Alas, this show will almost certainly not be that show. So, sort of like a mix of Person of Interest, Early Edition, and Joan of Arcadia. Alas, this show will almost certainly not be that show. And Serial Experiments Lain (previously on the blue). That would be a way better show. It could come on right after Catpeople of Yesteryear. Ah, so we have this years "Stairway to Heaven", "Touched by an Angel" or "Kevin (Probably) Saves the World" - it would definitely be nice to actually have a twist that yasaman hopes for... but, highly doubtful, this is no "The Good Place". I thought it was schmaltzy but still watchable if, like oh yeah says, you get past the millennial trappings and cliche atheist premise. I really like the cast, mostly because that's friggin' Jessie Quick (Violett Beane) and I really missed her on the Flash. And also Henry Deacon (Joe Morton) from Eureka! Definitely! Unfortunately, I didn't like it as much as I remember liking Early Edition, in spite of an appealing cast, and I took it off my DVR. Instead, it's the god in the machine. An artificial intelligence that organically arises out of all those social media algorithms and the internet, an entity that can approximate a kind of omnipotence and omnipresence via all the devices and cameras that make up our lives, and that decides to find itself a prophet. A story sort of like that won the Hugo award a couple of years ago.